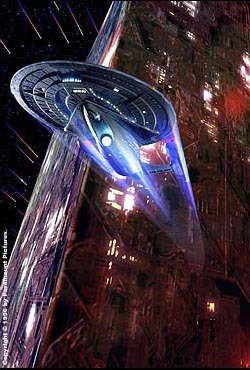 I believe that my favorite television series has to be Star Trek: The Next Generation. After watching the latest movie of that series, First Contact, I discovered that it had a great connection between the captains of the Enterprise and the Pequod. Here is a brief synopsis. Amidst a tremendous battle with their dreaded enemy, the Borg, the enterprise follows an escape pod into the past. The Borg pod traveled to the past in order to change earth's history. Before the Enterprise has time to stop them, the Borg significantly hinder an influential piece of the past. They destroy the ship that initiates earth's first alien encounter. The "First Encounter" with Vulcans initiates a new world order of peace. The story then splits into two parts, one where the Borg are trying to take over the Enterprise and the other on the face of the planet where crew members try to help their "heroes of the past." Picard leads the battle on the ship as the Borg slowly assimilate the ship and its crew. He was once a Borg and developed a passion for destroying them. He used his previous knowledge to destroy the Borg's main ship before the time travel. Picard continually grows in passion with each piece of ground the Borg gain. This is tragically similar to the plight of Ahab. Captain Picard was once wounded by the enemy, the Borg. Ahab, himself, lost a leg to his archenemy. Picard is continually reminded of his encounter through dreams. Ahab continually loses sanity as he nears the brooding behemoth. As the movie progresses, Picard systematically wipes out any of the crew members who are taken by the Borg. Ahab systematically takes out his crew as he reaches his destination. Picard is intent that the Borg will not take over his ship. In every encounter with humans, the Borg drew a stalemate or won. Every encounter with Moby, humans die or in Ahab's case only lose a leg. 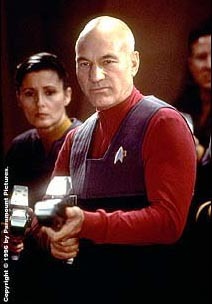 Picard finally peaks in his anger when he declares in his quarters that "the line must be drawn here!" He will yield no more to the Borg. Either he will win or die in the trying. Ahab also comes to that conclusion. He will win or die trying. 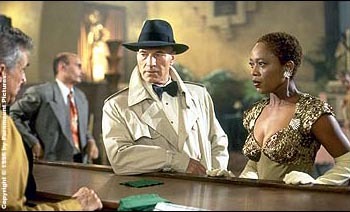 Surprisingly, the connection between Picard and Ahab is made when Lily Sloane, a newcomer to the enterprise, confronts Picard. Picard finally sees the self destruction he is heading for, with the price of destroying a trophy case and finally decides to destroy the Enterprise. In the end, he saves the enterprise with the help of Data, but came close to the brink of suicidal tactics just as Ahab did. All pictures of Firstcontact are copywrited. The terms of the copywrite are listed in the following site. If you want to download or copy any of these pictures you must be subjected to the terms stated in the site.